Introduction. The high-risk NMIBC patients are treated either TUR plus intravesical BCG immunotherapy or radical cystectomy according EAU Guidelines. However elderly patients are not good tolerated to BCG therapy or not suitable for radical cystectomy due to comorbidity. The hyperthermic intravesical chemotherapy (HIVEC) might be an alternative treatment option for these patients. Objective. The aim was to study first experience of HIVEC by COMBAT BRS recirculation system with Mitomycin-C in high-risk NMIBC patients. The early adverse events and morphological tumor changers were evaluated. 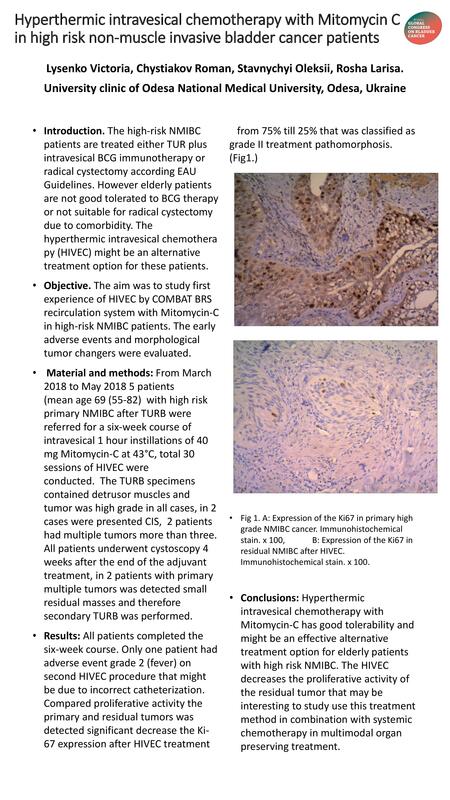 Material and methods: From March 2018 to May 2018 5 patients (mean age 69 (55-82) with high risk primary NMIBC after TURB were referred for a six-week course of intravesical 1 hour instillations of 40 mg Mitomycin-C at 43°C, total 30 sessions оf HIVEC were conducted. 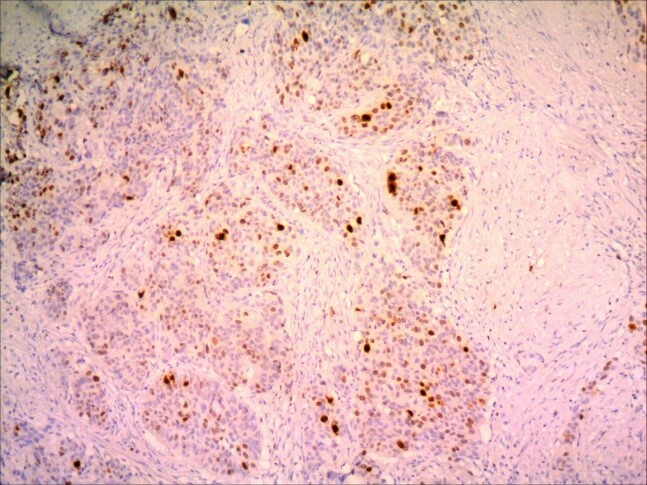 The TURB specimens contained detrusor muscles and tumor was high grade in all cases, in 2 cases were presented CIS, 2 patients had multiple tumors more than three. All patients underwent cystoscopy 4 weeks after the end of the adjuvant treatment, in 2 patients with primary multiple tumors was detected small residual masses and therefore secondary TURB was performed. Conclusions: Hyperthermic intravesical chemotherapy with Mitomycin-C has good tolerability and might be an effective alternative treatment option for elderly patients with high risk NMIBC. The HIVEC decreases the proliferative activity of the residual tumor that may be interesting to study use this treatment method in combination with systemic chemotherapy in multimodal organ preserving treatment.